Easy to See the Difference for protecting your car's paint care. Conventional car polishes contain abrasive particles that can scratch paint and clearcoat. Too EasyTM Finish Protectant contains no abrasives to scratch paint or clearcoat. These particles can also dry out and discolor rubber, vinyl, and plastic trim. Acid particles and other contaminants can become trapped under conventional car polishes. When the trapped particles are exposed to sunshine, the damage they do to the paint can accelerate. Too EasyTM does not seal the paint. Acid particles and other contaminants cannot become trapped. Instead, they are dispersed and neutralized. Resins used in some conventional car polishes can become brittle and develop hairline or spider web cracks. The result is a hazy appearance, and open avenues for contaminants to get at your vehicle’s paint. Too EasyTM’s patented protective coating expands and contracts to prevent the formation of hairline and spider web cracks. When new vehicle paint is sealed under a film of silicone or polymer resin, the paint may not cure properly. Also, these resins must be dissolved in solvents. 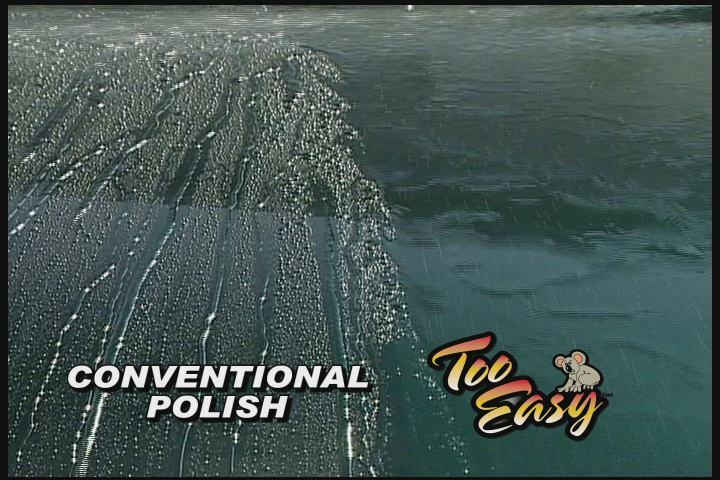 Each year, millions of gallons of solvent are released into the air—just from people polishing their cars! Too EasyTM allows new vehicle paint to breath. And Too EasyTM contains no solvent, so no harmful vapors are released into our atmosphere.